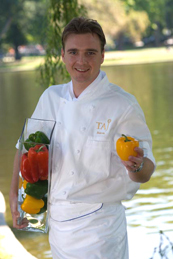 Executive Chef Franck Steigerwald of the gourmet restaurant, The Café at the Taj Boston in Boston, Massachusetts provides a delicious taste of the menu where the focus is on French, New England, and Indian cuisine with recipes for a three-course dinner. I had dinner at The Café in October 2008 and had the opportunity to sit down and meet with Chef Franck Steigerwald to discuss his culinary approach. Growing up in the Bordeaux region of France, he was immersed in its rich food culture, and although he always appreciated good food, he did not originally plan on becoming a chef; he has a degree in mathematics and physics. However, when he was twenty years of age, he observed a Sunday cooking class at a friend-of-the-family's Michelin restaurant, and watching the chef's passion and artistry, he was struck with the idea that this was something that he wanted to do. So, he approached the friend about doing an apprenticeship at his restaurant. The friend replied that he must first work one day in the kitchen of the restaurant, not at a cooking class, but actually working in the restaurant all day, and at the end of the day, Franck could decide if this was something that he really wanted to do. Not one to be discouraged easily, the following day he arrived at 6:00 am at the restaurant where there were 12 cooks working in the small kitchen preparing for a dinner that evening for 350 people to be given a château. His task was to make tuile baskets, those impossibly fragile and delicious cookies that must be shaped while they are still warm from the oven. He worked for 8 straight hours making the tuile baskets and went without lunch. He confessed that it probably would have taken a chef 3 hours, however he kept breaking the baskets, but he kept at it. Tuile baskets complete, he helped load the truck, went to the château to assist with the dinner, reloaded the truck at the end of the evening, returned to the restaurant at midnight, unloaded the truck, and then since his position was the lowest at the restaurant, he had to stay and clean up. He declared that it was the worst day of his life; however, the next day he called the owner of the restaurant to say that he wanted to give it a try as an apprentice. The friend still was reluctant, and told him to try to apply at other Michelin restaurants, which he did, without any success. Finally, his friend acquiesced and took Franck on as an apprentice, which was a mutually successful situation as Franck went on to win France's apprentice gold medal. Since his initial foray into the kitchen, he has continued learning by working with top chefs throughout France and the United States, and brings an unbridled passion and artistry in his approach to cuisine. Although expert at both savory and patisserie, it is the art of sugar that captured his heart. Making sugar art requires precision, a good eye, and a feel for the product. Like his other techniques, he learned the art of sugar from one of the best chefs and enjoys working at perfecting this craft. The Café changes its menu seasonally and has begun introducing Indian specialties to the menu, which have been well received. In his role as Executive Chef at the Taj Boston where he has 40 chefs working, his focus is to make good food and to please the client. His motto is to not overload the plate, cook the food perfectly, and use one sauce, which he said is also in keeping with the Taj motto, to make and do things to perfection. What he loves most about his job is the sharing part of cooking and being sensitive to the chefs working for him. When not in the kitchen at the Taj Boston, he enjoys spending time with his young family. Method: Place all ingredients in a food processor, and blend until paste consistency. Method: Sear the scallops in olive oil for 2 minutes on each side until golden. Cut the vegetables into 3-inch (7.6-cm) bâtonnets (sticks) and blanch. Slice the tomatoes in half and toss with the vegetables and the olives in a bowl. Add some olive oil and chives. Season to taste with salt and pepper. Place the scallops on the dish with a tablespoon of pesto and artfully arrange the vegetables. Method: Heat oil in a pot and add the whole spices, followed by the onion puree and cook until golden brown. Add the ginger garlic paste and sauté. Add the lamb and sear, then add the degi mirch and continue cooking with the yoghurt. Cover the meat with stock or water and simmer until done. Add tomato puree to the cooked meat and reduce the sauce by 3/4, add mace and cardamom powder. Garnish with cilantro and red oil. Serve with steamed rice and mango pickles. This recipe for Caramelized Apple Napoleon combines sweet mascarpone cheese layered with cinnamon sautéed apples atop a sable crust, crowned with a clear opaline sugar disk, and served with an apple brandy sauce and candied pecans. Method: Cream the butter and sugar until light and fluffy. Add the egg yolks slowly, one at a time, scraping the sides of the bowl after each addition. Scrape the vanilla bean into the egg mixture and then add the rest of the dry ingredients. Mix well, making sure that all of the ingredients are combined. Chill the dough in the refrigerator until firm. Roll the dough out to 1/3-inch (0.84-cm) thickness. Cut to ring mold size and bake at 350° F (177° C) until golden brown. Note that the best results are achieved when the dough is baked inside the ring molds. Method: Melt the mascarpone cheese in a pot carefully, stirring continuously. Mix the egg yolks and sugar together immediately and then mix with the hot mascarpone, being careful to not to cook the egg yolks. Cook the mixture over low heat until the mixture thickens, being careful to not curdle the egg yolks. Soak the gelatin in the measured amount of water and add to the hot anglais. Cool the mixture to 90° F (32° C). Beat the heavy cream until it forms soft peaks, and then fold into the cooled mixture. Place in the refrigerator to chill until firm. Method: Combine fondant and glucose and cook to 320° F (160° C). Add the rest of the ingredients and stir. Pour onto a non-stick silicone mat and let cool. When cool, grind the mixture to a powder in a food processor and using a sifter, dust the powder into rounds on a non-stick silicone mat. Bake in the oven at 375° F (191° C) until melted no more than 2 minutes. Method: Put all the ingredients in a pot. Simmer to reduce until sauce reaches a syrup-like consistency. Method: Chop the pecans to pea size pieces. Toss them in a small amount of simple syrup to just coat. Spread the nuts on a baking sheet with parchment and then sprinkle generously with cinnamon sugar. Toast the nuts until lightly toasted and crunchy. When the nuts are done toasting, toss again with cinnamon sugar. Let cool and use as desired. Method: Peel, core, and dice apples into ½-inch cubes. Sauté with small amounts of all of the ingredients listed except the apple brandy. When the apples are tender, flambé with the apple brandy. Cool the apples and store in an airtight container. Dessert Assembly: Brush the sable cookies with melted cocoa butter to keep them from getting soggy. Pipe rounds of mascarpone cream around the outside of the sable cookie using a round pastry tip and a plastic piping bag. Fill the inside of the circle with the sautéed apples without the juices. Top this with an opaline disk and repeat the process. Top the last layer of mascarpone cheese cream with another opaline disk. Plate the dessert as desired. Bon appétit! Read about the Taj Boston and The Café in the Hotels and Resorts and Restaurants sections.